The size of my carousel would be 600 pixels width and 200 pixel height. Just to debug the occupation in the page I set its background color to a light safe color grey and a border to a little bit darker gray than the background. Just to ensure that all the contained elements will fit the entire size i will set the padding to 0. Then we will make sure that the UL will fit the entire area and resetting its margin. And in the end, we want to display just the 5 elements from the list no one more! 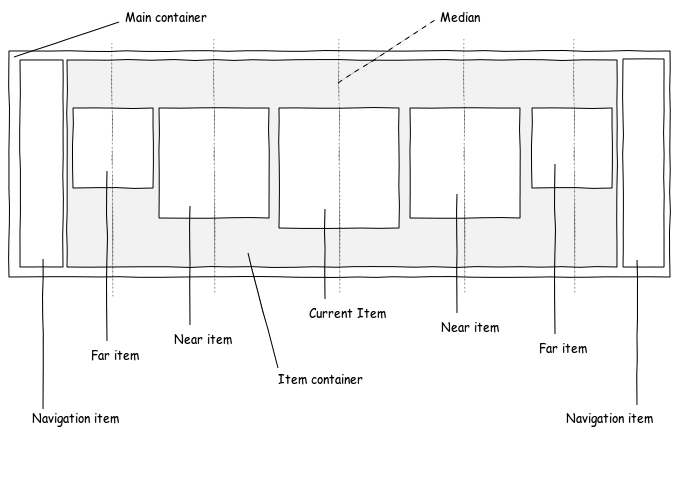 Each item will occupy a 20% of the available space including eventual margin, so we define a width of 16% of total width and a margin on both left and right of 2%. Using the box-sizing property we ensure that the 16% of the content will count the 1px border too and an hypothetical internal padding. In the following way we make a cross-browser box-sizing. To avoid the overflow of the contents just tell it to be hidden. If you want you can see the stylized carousel in action. In the next week we will build our jQuery Simple Semantic Carousel Plug-in.